If as Lizabeth Cohen argues in A Consumers' Republic that postwar government policies as represented by the G.I. Bill, VA/FHA home loans, and new tax policies sought to create a “consumer republic” that enhanced the purchasing power, conflating citizenship with consumerism, this new orientation reverberated politically, socially, economically, and spatially. While most writers have focused intensely on housing and school desegregation struggles, others have employed a broader lens, employing critical race theory to popular culture of the age. 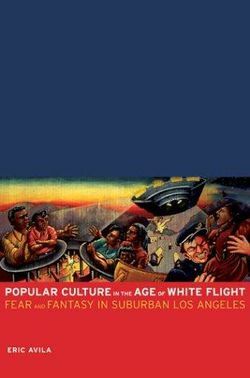 Avila work emerged at the same time as related scholarship exploring the role of the late nineteenth and early twentieth-century white elites in the recasting of Los Angeles as a white city. For example, William Deverrall's Whitewash Adobe" the rise of Los Angeles and the Remaking of its Mexican Past examines this very process as whites employed several methods of "whitewashing" the city's culture and history. These methods included the use of cultural productions such as plays and parades in order to minimize Mexican significance, housing spatialization that separated Mexicans from whites, and the isolation of Mexican neighborhoods through ethnocentric public health rhetoric which conflated these communities with disease and epidemics. Even Los Angeles' La Fiesta Parade, which featured numerous ethnicities and races did so in the pursuit of profit all while reifying racial/ethnic hierarchies, as Deverall points out "The Genius of La Fiesta was that it appropriated, enviously, celebratory aspects of regional Mexican culture for commercial and boosterish purposes of white Los Angeles. La Fiesta made it possible for whites simultaneously to borrow from and denigrate supposedly innate Latin cultural forms. Even more remarkably, La Fiesta's creators did so in a scripted atmosphere of presumed ethnic peacefulness, even progress." (Deverall, 63) According to Deverall, cultural production attached various traits to Mexican residents while policies and economics conspired to isolate them from whites. If systems, economics, and racism removed the physical presence of Mexican Los Angeles from its white counterpart, then cultural works like La Fiesta and John McGroaty's popular Mission Playprovided narratives that minimized or marginalized non-whites, notably Mexicans. As government policies attempted to reconstruct American identities along consumerist lines, white suburbanites attempted to build a “classless” ideal that separated them from the “darkened” inner city. For example, the post-war decline of neighborhoods like Boyle Heights and Watts, a decline due in great part to HOLC/FHA policies, and the rise of suburban enclaves like South Gate meant suburban residents hoped to differentiate themselves from the evils of urban living. Thus, as “the expansion of suburban California provided a mythic space for the construction of a new “white city,” Bunker Hill, Boyle Heights, and Watts provided convenient straw men for the emerging “cinematic vision of a black and alien Los Angeles.” Here Avila juxtaposes the portrayal of the inner city in Los Angeles film noir with the rise of Disneyland, each representing an idealized/demonized version of metropolitan regions. If film noir highlighted the threats of a city inhabited by untrustworthy women and non-white citizens densely and dangerously packed into urban spaces, Disneyland symbolized the epitome of decentralized, privatized white suburbia, functioning to provide “a space where white Southern Californians could affirm their whiteness against a set of racial stereotypes.” Regarding family structure, Disneyland delineated a “social order” that appealed to the tastes and desires of both a growing middle class and an “embourgeoised working class” emphasizing patriarchy and the nuclear family. (137) While writers such as Matt Lassiter have argued for an end to division in scholarship between the suburbs and cities, Avila seems to have addressed this relation in the negative. For Avila, in many ways like a post-war American Orientalism, the “vanilla suburbs’” identity depended on the symbolic “chocolate city” as the “other.” Relatedly, Lisa McGirr’s Suburban Warriors: The Origins of the New American Right explored Orange County’s middle and upper-class residents’ contributions to the construction of the conservative ideology that fueled the Reagan Revolution. Avila credits Disneyland for cradling this “racialized conservatism that informed the nascent political struggles of the New Right,” providing a popular culture touchstone for a burgeoning social movement. Undoubtedly, Los Angeles’ role as cultural producer influenced such developments. The suburban decentralized nature of Southern California, when portrayed in movies, television, and via Disneyland reinforced such conceptions of post-war America. Moreover, noir’s postulation of the city suggested a shift form Enlightenment ideals of urban areas as Avila notes, “In contrast to the enlightenment view of the Western city as the site of individual opportunity and the summit of social progress film noir emphasized the social and psychological consequences of urban modernity.” (69) Lisa McGirr’s Orange County Republicans epitomize this view. During the last few decades, the Dodgers were in Brooklyn, the demographics of the borough fundamentally changed. More nonwhites moved into the borough and became Dodgers fans. They began attending games which sometimes caused disagreements with white Dodger fans. Avila acknowledges, “many whites resented how blacks favored black players while seeming to ignore other players.” (151) Postwar housing and infrastructure policies undermined urban teams’ financial support. Additionally, the increasingly interracial environment of Ebbets Field drew suspicion from its once primarily white working-class fan base. When the Dodgers moved West to Los Angeles, the city agreed to remove those residing in Chavez Ravine so that Dodger’s stadium could be constructed. Labeled “blight ridden,” no doubt in part to the significant Mexican/Mexican American population residing there, public referendums approved of the use of eminent domain by the city. Los Angeles’ proximity to Hollywood enabled Dodger officials to harness the power of fame to promote the decision, “After starring in the opening telecast of Disneyland in 1955, Ronald Reagan appeared on the Dodgerthon, decrying the argument against Proposition B as “one of the most dishonest documents I ever read in my life.” (165) Unions proved no more protective as they joined “the pro-growth coalition … supporting the construction of Dodger Stadium in the Chavez Ravine.” (169) Cohen’s work suggests that unions nationwide adopted this position in a push for increasing the purchasing power of working-class members. Moreover, though Avila acknowledges that in some ways the Dodgers served as a “communal glue”, it failed to be all-encompassing as it remained tied to masculinity, “in whatever ways major league baseball helped to solidify interracial alliances in Los Angeles, it so around idealizations of male athleticism, competition, and camaraderie.” (181) For Avila, Dodger Stadium reiterated the vision of a “monumental family friendly and well-insulated environment that suited the classless fantasies of a suburban public fleeing Ebbets Field and its slum-like setting.” (183) It symbolized the political shift in which social programs like public housing received increasingly less government funding, instead encouraging subsidies for private development, thus stoking racial tension and conflict. Avila and Deverall provide a useful pair of studies for understanding the history and cultural productions that have created the image of a white LA. Besides their historical inaccuracy, the problem with such conceptualizations the inscribing of whiteness on a region historically not white truncates the public's understanding of its real place. As numerous others have pointed out, the Mexicanization of Los Angeles serves as a return to historical tradition not a break from it. While Deverall and Avila's works remain confined to cultural observations, lacking economic and political contexts of more social or quantitative histories, they successfully establish a frame from which to question the meaning of the Los Angeles narrative. ↑ please do not pretend that anyone really thinks of Manhattan as a borough and if they do they are lying. This page was last edited on 8 March 2019, at 17:13.